﻿ Spain - Guided group - Soft walking on the Camino Frances. Walking on the Camino Frances or French Way : a small guided group, 10 days from Saint Jean Pied de Port to Santiago de Compostela. For those who wish to catch the Spirit of the Camino to Santiago de Compostela but do not feel like walking 20 km per day, we propose an English speaking guide-driver driving a follow van. The group is composed of 8 persons max. 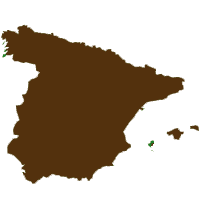 This is a discovery of the most beautiful stages of the Camino Frances with stopovers on the most renowned places. Hotels, dinners, luggage transfers, guided driver included on the whole Camino to Santiago de Compostela and even Cabo Fisterra. 3 hours of walking per day without technical difficulty. The van driven by your guide follows you, taking you to the start of the walks. Join a group on your own on the dates we propose or create your own group on the date of your choice ! Start of the trip in St Jean Pied de Port in the afternoon. This fortified medieval city is the last stage in France before reaching Spain and Roncevaux Pass across the Pyrenees. Hotel in BB. St Jean Pied de Port - Puente la Reina. Meet with your guide driver at 8h30. Transfer to The Croix Thibault and walk to Roncevaux - 11km (7 miles) - 3 hour walk. 14h30 transfer to Puente la Reina. Hotel in BB. Puente la Reina – Santo Domingo de la Cazalda. Walk to Lorca – 12 km (7.5 miles) – 3h30. Meet in Lorca at noon and transfer to Sto Domingo de la Cazalda with possible visits of Monasteries in Iratxe, Najera. Hotel in BB. Santo Domingo de la Cazalda-Burgos. Walk from Villafranca Montes de Oca to San Juan Ortega - 12km (7.5 miles) - 3h30. Transfer to Burgos and visit the city on your own. Hotel in B&B. Burgos to Carrion de los Condes. Transfer to Fromista and Villovieco. Walk to Carion de los Condes – 13 km (8 miles)– 3h30 Hotel in B&B. Carrion de los Condes - Leon. Transfer to Terradillos de los Templarios. Walk to Sahagun- 13,5 km (8 miles)– 3h30. Transfer from Sahagun to Leon. Visit the city on your own. Hotel in B&B. Leon – Villafranca del Bierzo. Transfer to Foncebadon by Hospital de Orbigo (visit the bridge) and Astorga (Cathedral and Gaudi Palacio can be visited). Walk from Foncebadon to El Acebo – 13 km (8 miles) – 3 hours walk. Transfer from el Acebo to Villafranca del Bierzo by Molinesca and Ponferrada (possible visit of the Templiers Castle). Hotel in B&B. Villafranca del Bierzo - O’Cebreiro. Today you can choose your walking time with a minimum stage from Ruitela to O Cebreiro - 10,5 km (6.20 miles) - 2h30. Hotel in B&B. O’Cebreiro - Rua. Transfer from O Cebreiro to Samos with the possible visit of the Monastery. Walk from Ventas de Naron to Palas del Rei – 12,5 km (8 miles)- 3h00. Transfer to Rua Casa Rural in B&B with a swimming pool. Rua - Santiago de Compostela. Transfer from Rua to Labacolla. Walk from Labacolla - Santiago - 10 Km (6 miles) – 2h45. Visit of Santiago on your own. Hotel in B&B. Extension to Cabo Fisterra by van and way back to Santiago where you finish your pilgrimage. From Santiago you can take your plane or your train to the city of your choice or choose to come back to Bayonne Station in France with your guide driver. The guide driver, lives in Saint-Jean-Pied-de-Port and are experts of the Camino. They will share her passion with you ! You can compose your own group with family or friends! 5 persons is enough to create your own group! Just choose the date of your choice and send us an email. If you are alone or less than 5 just choose one of the dates proposed above ! The accommodation in 2 star hotels in double room for 10 nights. The transport of your luggage from stage to stage. The van as well as the expenses of the road. An English speaking guide driver. The transfers from the airport or station and the meeting point on the first day and on the last day. Click on "Book Now "
The payment is made with your credit card number directly to the Agency Chemins de France’s Bank Account. Within 48h we will give you a confirmation invoice by e-mail. Payment for customized groups can also be done by wire or Credit Card directly to the Company Chemins de France. English speaking guide driver expert in the Way of Saint James. Groups only composed from 5 to 8 persons max. Level 1 : Walks average 3 hours per day. More information on the levels ? Train : TGV to Bayonne or Biarritz . Transfer possible to Saint Jean Pied de Port. Airport : Biarritz Parme. Flights from Paris, London, Brussels, Manchester, Geneva, Rotterdam.